I’ll be spending the second half of the week at two conferences, so you beautiful readers will have to cotent yourselves with something (relatively) short and sweet this week. Never fear, however, as I do have a new finished model to share with you. 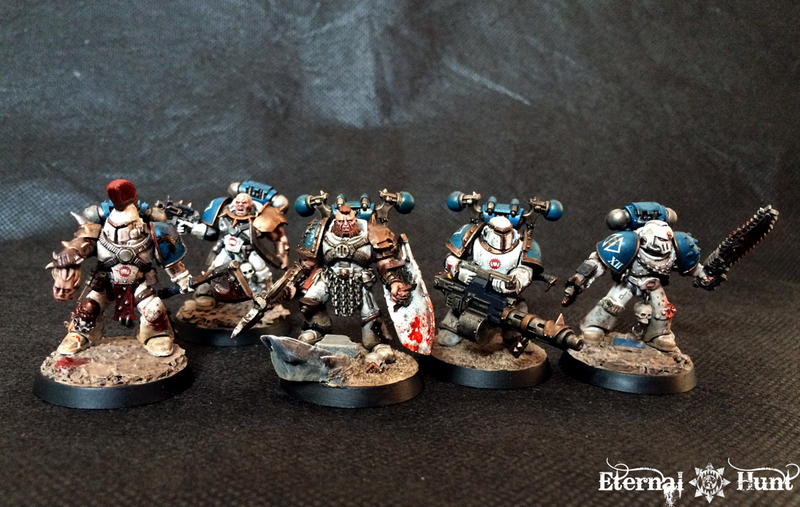 A couple of years ago, I would routinely sit down and create a new World Eaters conversion several times a week. 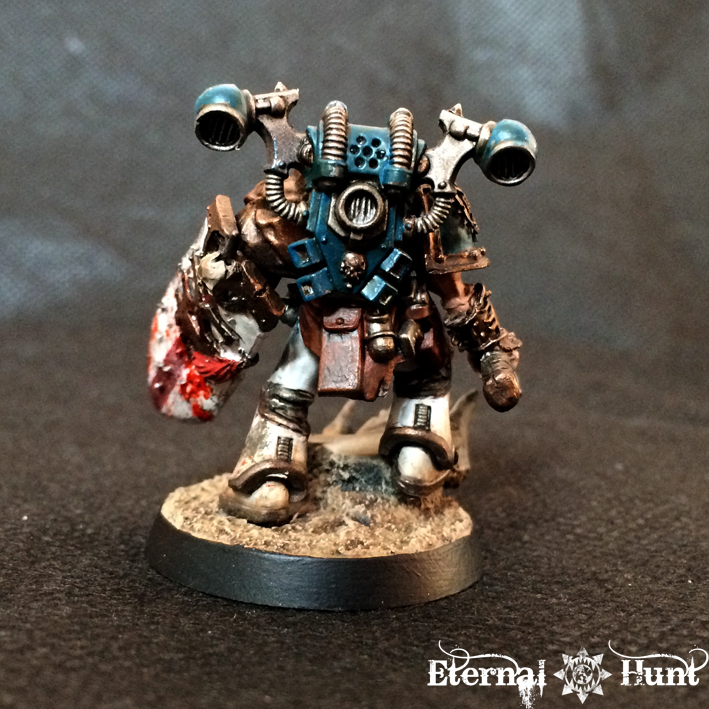 It was just a neat way of widening my conversion horizons, and the World Eaters look and feel really clicked with me — and still does, at that. 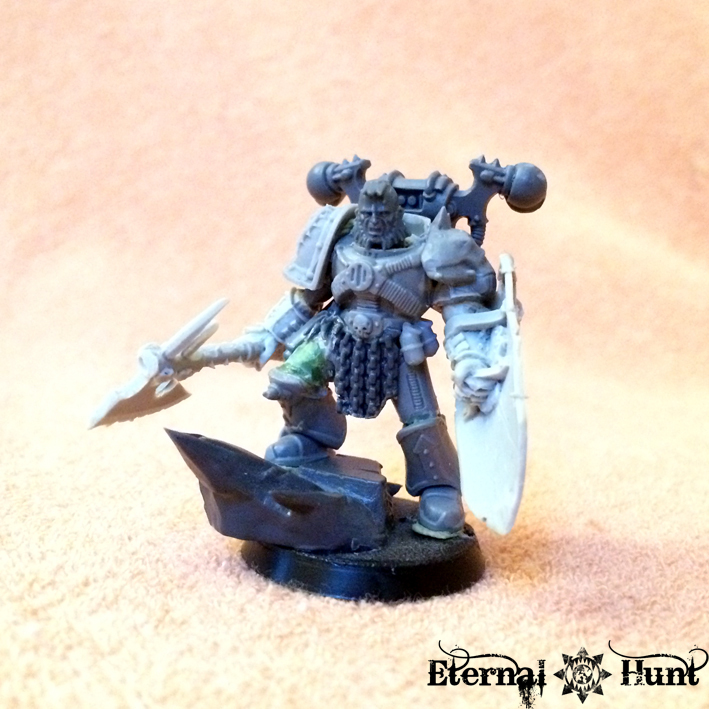 As for the actual conversion, most of the model consists of a plain old vanilla Chaos Space Marine. I cut the legs apart and reposed them in order to make the pose more interesting and add some height to the model. Both arms came from a Finecast Champion of Khorne, still available from GW, albeit called an “Exalted Deathbringer” these days. Several people gave me grief over the way the model is holding its shield, correctly pointing out that shields, or at least tower shields, normally don’t work that way. To that I say: Fair enough. I could make things easy for myself here and point out that the blame actually lies with GW’s sculptors. But to be perfectly honest, I rather like the shield arm, and I decided I would use the paintjob to show how this guy uses his shield more as a weapon than as an item of defense. 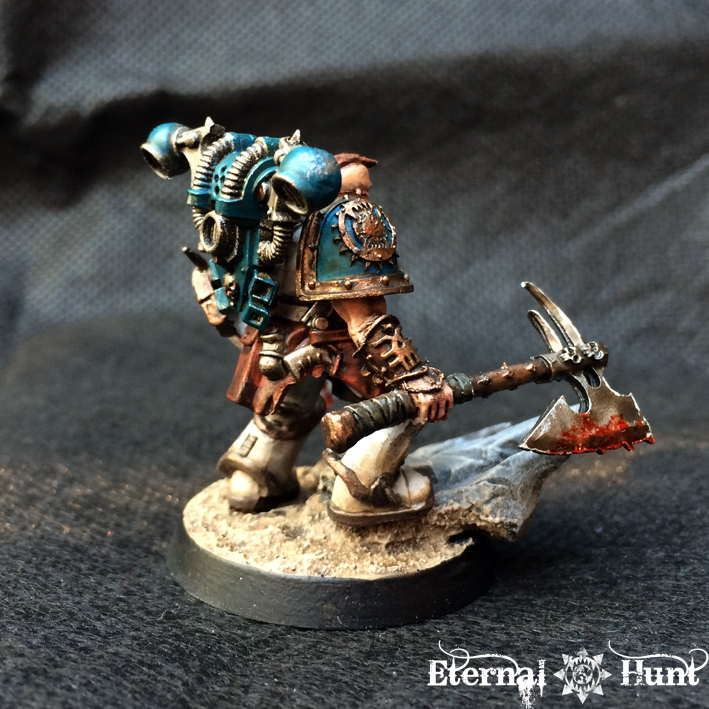 The part that really finished the model was a head from the Space Wolves Terminators, purchased on a whim when I was hunting around for interesting Astartes faces. I think it really turns the model into a character, and it’s also slightly less monstrous than something you would expect in a Khornate 40k army — it just works far better for a Heresy era offcier, if you ask me. “You ask if this is what I wanted for myself, remembrancer? If this is what I dreamed of? Who could ever dream of a life such as the one we lead and crave to do as we do? So let’s take a closer look at Hamund, shall we? 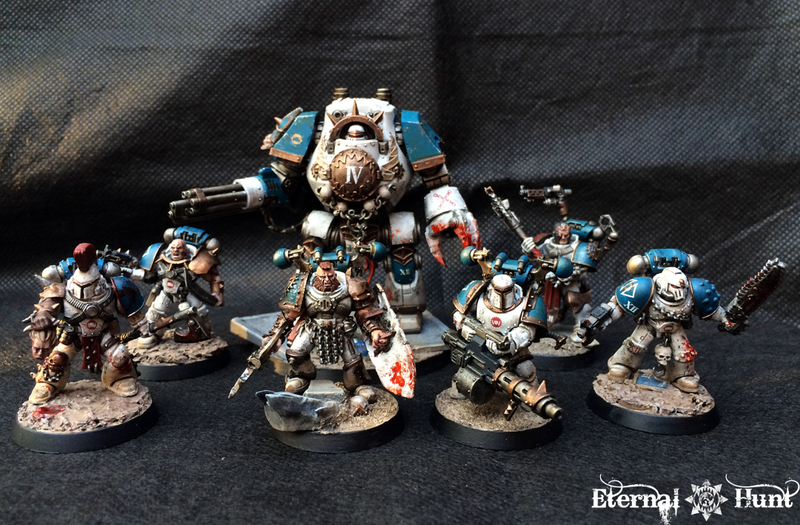 So, a couple of notes on the model: I mainly stuck to my established World Eaters painting recipe. The most interesting area was the shield, because I wanted to make it look really grisly — and I also wanted to hint at the fact that Hamund probably uses it to give opponents a good beating or even slice open a jugular vein here and there, if push comes to shove. So making it look suitably battered and gruesome was a fun challenge alright! However, to be perfectly honest with you, painting Hamund turned out to be a rather massive slog, all in all, both because the conversion was pretty messy, using some very beat-up parts, and because the arms came an fairly early Finecast model (i.e. lots of bubbles and warping). With those factors in mind, I am pretty happy with the finished model: His patched-together suit of mongrel-plate really gives him a suitably World Eater-ly look, and the smaller Khornate symbols scattered over the model could be seen as the War God’s influence slowly beginning to manifest during the latter stages of the Heresy. So yeah, feel free to let me hear any feedback you might have! And, as always, thanks for looking and stay tuned for more! 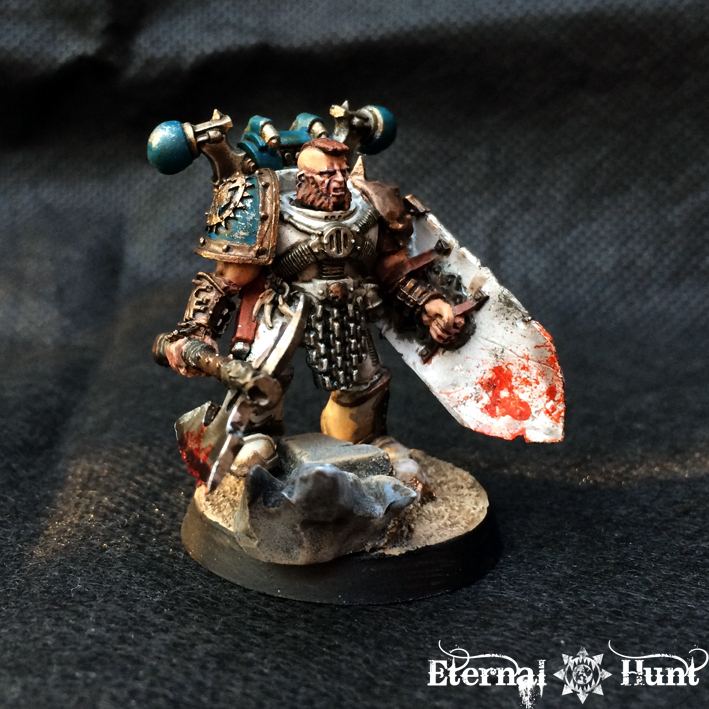 This entry was posted on March 29, 2017 at 12:00 and is filed under 30k, Conversions, Fluff, paintjob, World Eaters with tags 30k, background, conversion, delegatus, hamund, Horus Heresy, khorne's eternal hunt, kitbash, officer, paintjob, plastic, plastic heresy, praetor, secutor, world eaters. You can follow any responses to this entry through the RSS 2.0 feed. You can leave a response, or trackback from your own site. He’s really cool – I kinda like that shield, and the way he is holding/using it. His super-strength and power armour would let him swing that bad-boy round all day long! I’m really liking the shield and the different armour plates. 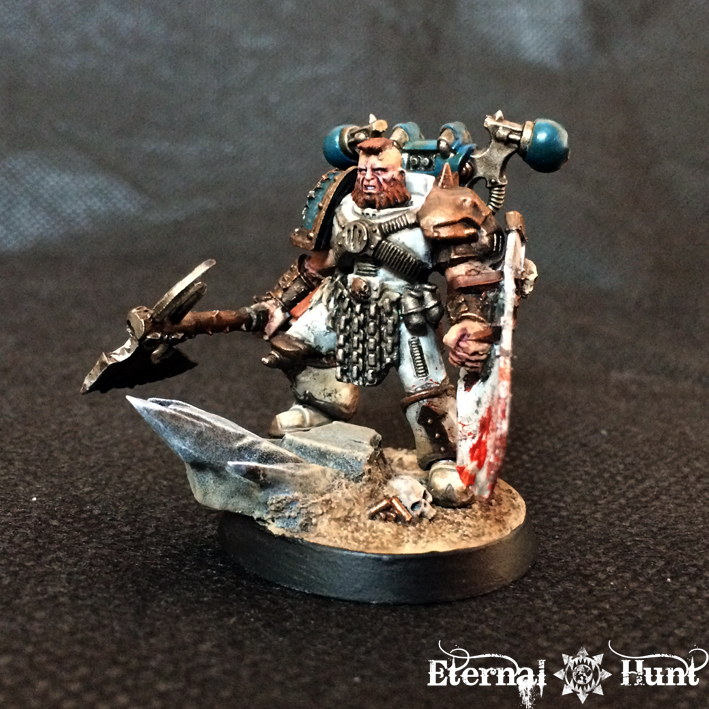 I’m not sure about the beard though, maybe it will grow on me (no pun intended), I just don’t picture a World Eater with a beard. The axe looks very business like, just the right amount of gore without it looking OTT. A fine addition to the VII Legion. Brutal looking dude, especially the way he holds the shield like a massive stabbing weapon. And the blue on the backpack and shoulder pads is great. What colour is it? Cheers, Thomas! The blue is merely Vallejo’s Magic Blue with a drop of black mixed in. I also add a sepia wash on top to take some of the vibrancy away. I like Secutor Hamund. His name is apt, you have captured something of a mournful cast to his expression and pose. One of the things I like about the Horus Heresy is that, especially early on, the Ruinous Powers are pretty much unknown. The rising tide of corruption is ignored or misinterpreted as martial pride, individual heraldry or simply decoration, and as such the Secutor may not even know what the runes on his shield represent. I’ve seen some discussion about whether or not people used or could use tower shields in the way you describe, but with the paintjob it certainly looks believable to me. He looks well and punching with the edge of your shield was a valid choice. Looking forward to seeing the little collection grow. 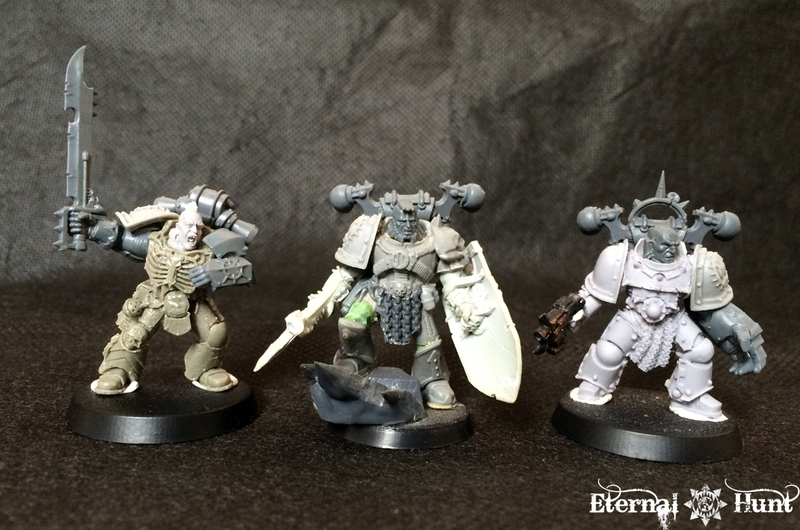 Is that a legion of the dammed model as a base? Thanks, man! I suspect it’s Eigar you are referring to, right? 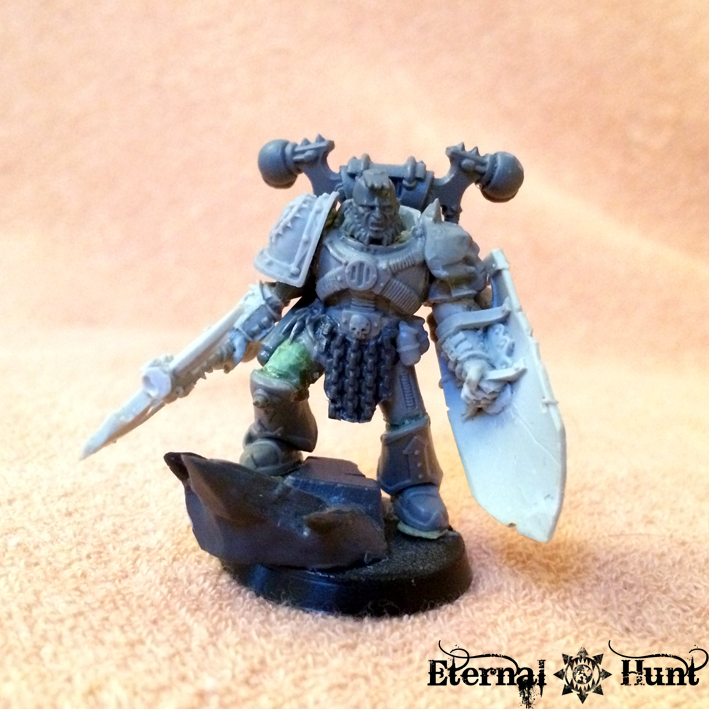 He’s based on the Minotaurs chaplain model (“Ivanus Enkomi”, I believe?!) Augustus b’Raass sent me a while ago. Beautifully done, man! 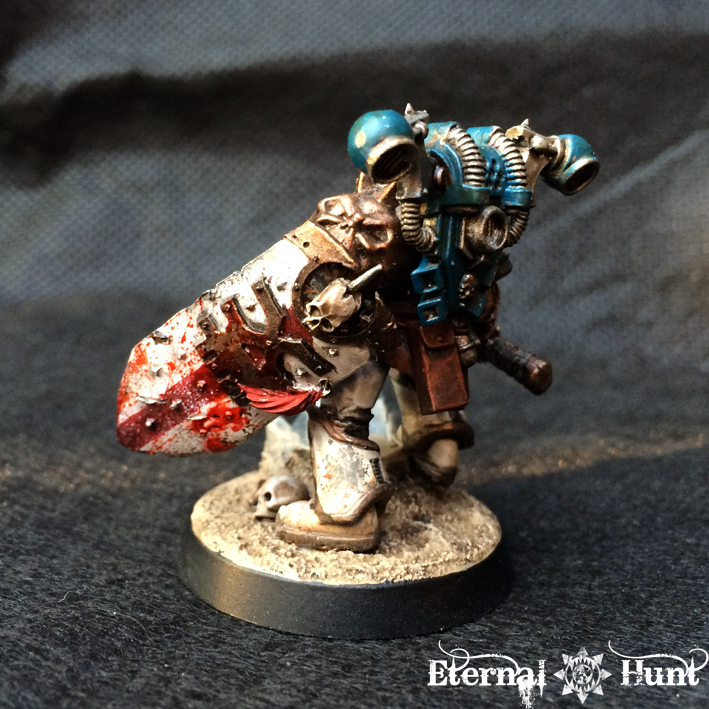 He looks fantastic in the heresy scheme! The only complaint that I would have with the model is the fact that the shield’s design doesn’t really seem to gel with how you added the blood. I feel like it would be used as a finishing weapon, bringing the pointed end down to spear an enemy. Basically I feel like there should be a *teeny* bit more blood on the pointed tip/bottom edge. Other than that, fantastic job! I think it’s amazing how you manage to take factions and color schemes that I’ve always found drab or uninteresting and make them look good. In other news, I’ve finished Golden Legion Deathwatch Operative Krautus Oraton and am just looking for a quality camera before I can send you pictures for final approval. 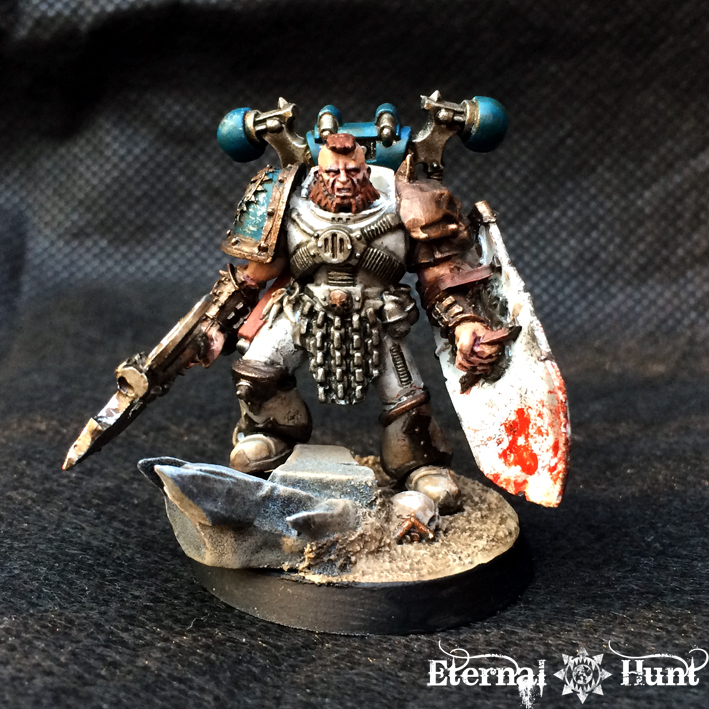 Quite good, although the obvious khorne symbols make me wonder about the period of the figure… is he in the early stages of heresy, or was this picture from when the World Eaters were slipping into madness without the wider Imperium noticing? A good point, really: As I already pointed out above, there may be a reason for Khornate symbols appearing relatively early on my 30k World Eaters: There was a campaign in their backstory when they fought against a fierce warrior clan, and they started to incorporate some of the clan’s traditions and symbols into their own company as a show of respect for a worthy adversary. Now you wouldn’t believe whom those barbarians were actually worshipping… 😉 Well, that and I believe it’s plausible that some kind of Khornate influence should begin to manifest within the legion after Angon’s ascension, at the latest. 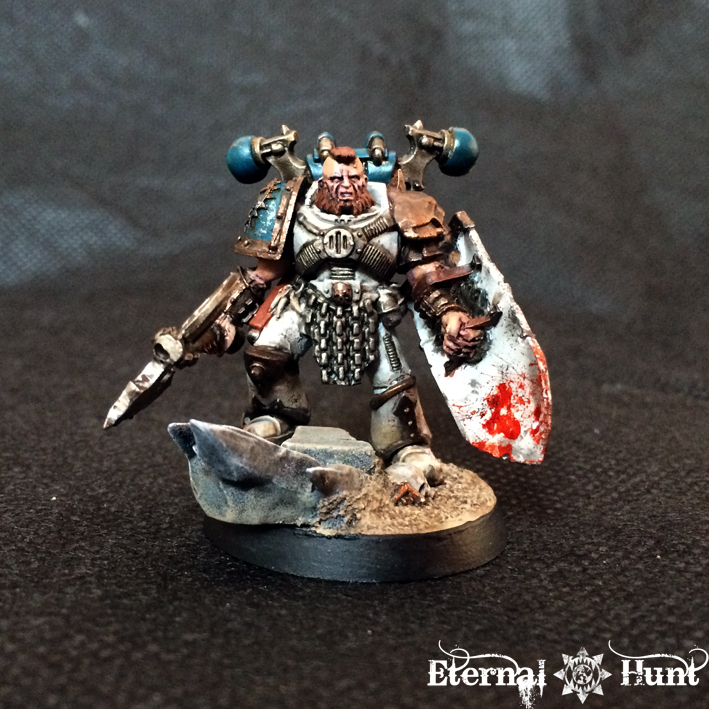 By the time of “Kharn: Eater of Worlds”, there are members of the legion who openly worship Khorne and serve as priests to him. Great work on him, I really like the head you switched to and the shield-weapon is a nice effect. Still defensive, but still a weapon as well. Looking good! I always imagined that his shield would be bloody, so it’s great to see that made it to the final version. 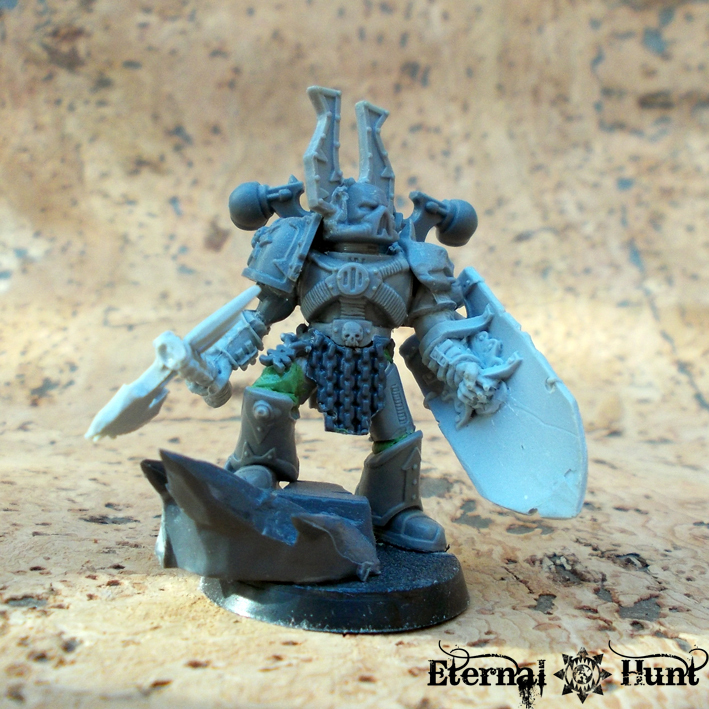 As far as the pretty blatant Khornate symbols on him, I would think that the Legion as a whole did not come to recognize Khorne at the same pace. Some would have jumped straight into his worship, others would have tried to resist for a time, some would have been oblivious as to what was going on until it was too late. 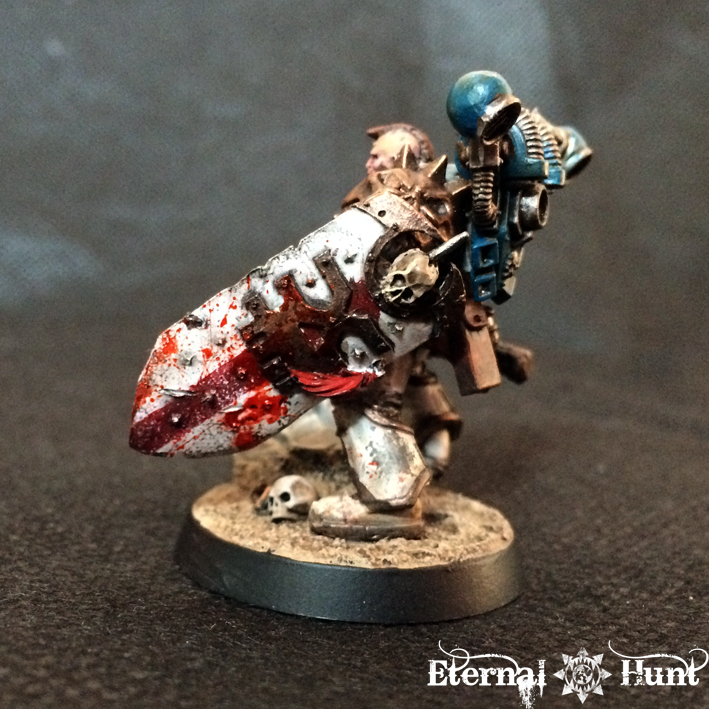 To me, the World Eaters at that point were so tortured on an individual level by the Nails that some of their brothers going full-on Blood For The Blood God wouldn’t have even registered in their peripheral. 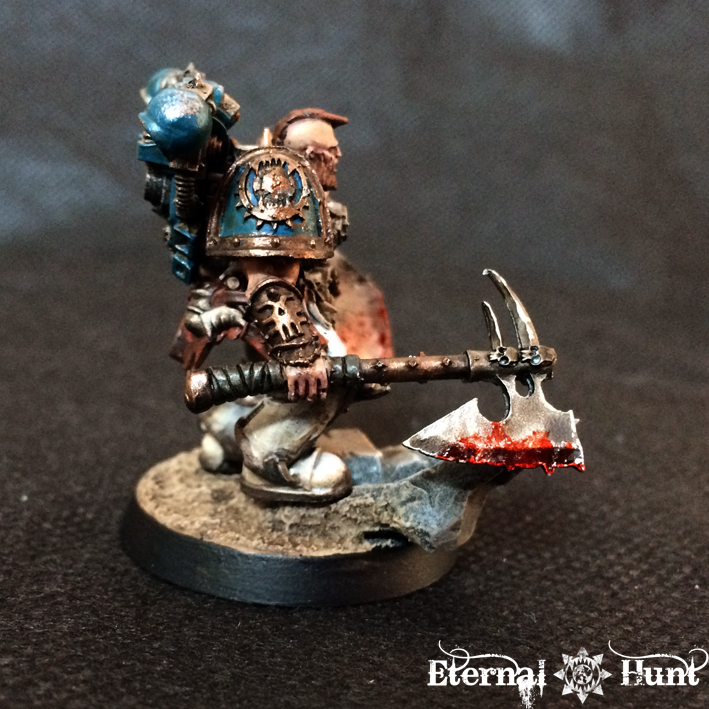 Clearly this guy embraced Khorne earlier than most others in the 4th. And maybe, from a storytelling perspective, that later caused tension between he and Lorimar, who may have seen Hamund’s eager worship as going against his own, more begrudging relationship with the Blood God.